1. Face/Body Wash: I use Cetaphil normal to oily skin as my facial wash. I tend to have a slight oily skin around my t-zone area and this product works perfectly in minimizing that and keeping my face smooth. Cetaphil is very gentle and great for anyone with sensitive skin. I have been using Cetaphil for 5+ years and I love it. I also use Dermalogica scrub 2-3 times a week. It is gentle scrub that works perfectly with my skin. 2. 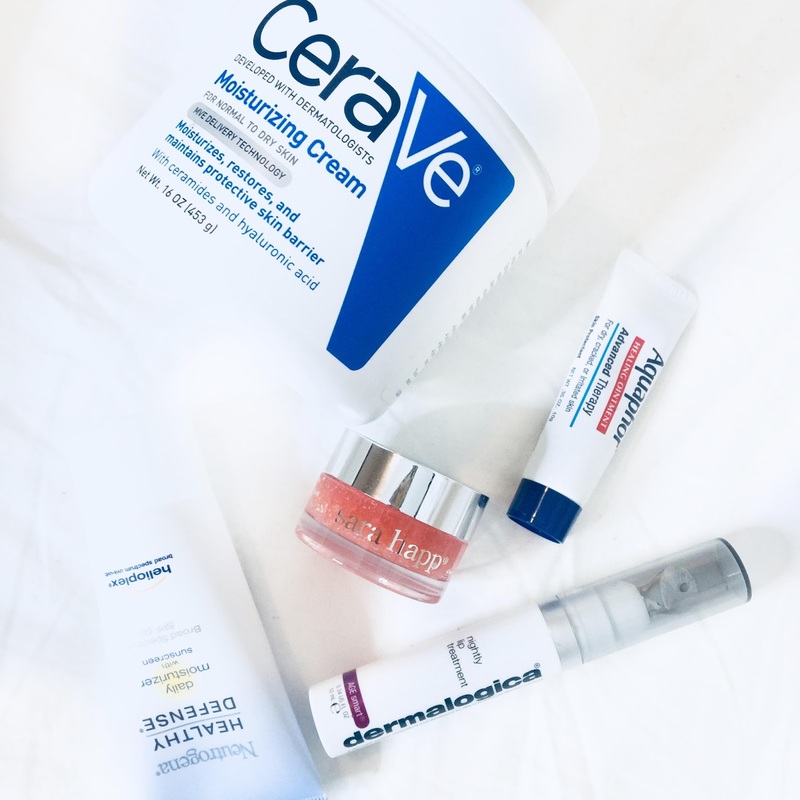 Moisturizer: I use Cerave moisturizing cream all over my body once I get out of shower usually when my skin is still a little damp. With the winter season, I sometime use it twice a day. For my face, I use Neutrogena healthy defense SPF50 or the Neutrogena oil-free moisture with SPF15. I also love Aveeno moisturizing cream. 3. Serum: I use Dr Dennis Gross Ferulic + Triple Correction eye serum around the entire eye area including the lids in the morning and night. I also look forward to trying out some a new serum, which I will be sharing soon. 4. Lip scrub: During the winter, my lips get dry and flaky, so I use Sara Happ sugar lip scrub to exfoliate. This sugar lip scrub is amazing and it smells so good. It leaves my lips ridiculously soft. 5. Lip balm: After using the lip scrub, I apply the Aquaphor Ointment to relieve the dry, flaky/chapped lips. At night, I use Dermalogica nightly lip treatment to restore and keep my lips hydrated. Another favorite of mine that I carry around in the Burt's Bees lip balm. Thank you for sharing your beauty product, I sure do need to get a lip balm, Your skin looks flawless.